For those of us on a wellness path, we likely know about the importance of lessening inflammation in our body. But what exactly is inflammation, what are the signs to look out for, and how do we keep our body in better balance? By definition, inflammation is an integral part of the body's immune response. It is how our body takes care of damages or injury caused by something foreign. For instance, say you cut yourself and it becomes infected. The body will send an army of white blood cells and other healing molecules to the affected tissue to help clean up the mess, removing harmful bacteria and their waste byproducts so that the damaged tissue can heal. The issue with inflammation isn't in these acute, isolated instances, but rather when our eating or lifestyle habits trigger a state of chronic inflammation in our body – when our immune system is working overtime to keep things in balance. When inflammation becomes chronic like this, our immune system can go a bit haywire and can even start attacking healthy cells too. This can lead to auto-immune issues and can play a huge role in many other degenerative diseases. Chronic inflammation has been identified by health professionals as a core issue in many modern health concerns including, but not limited to cancer, heart disease, diabetes, asthma, osteoporosis, and Alzheimer’s, to name just a few. In other words, where there is disease, there is inflammation to some extent. If you deal with chronic pain, gut and digestive troubles, re-occurring skin issues, or regular allergy flare-ups, you already have an intimate relationship with inflammation's effects on your body and how you feel. So how do we get a handle on this natural process when its chronic and out of balance? Diet is key. Health begins in the GUT. If you're looking for some awesome foods to add to your diet to help keep inflammation at bay – this list is a great place to start. Turmeric is perhaps the most well-known superfood for combating inflammation, all thanks to a group of compounds known as curcuminoids – the most important of which is curcumin. Not only does curcumin act as a powerful natural anti-inflammatory, but it also as antioxidant capabilities which helps prevent free radical damage. Curcumin is a fat-soluble compound, so ingesting turmeric with a healthy fat source is recommended. It has also been shown that a compound found in black pepper called piperine may increase the bioavailability of curcumin by as much as 2000%. Try making a delicious turmeric latte which combines plant-based milk with turmeric, black pepper, fresh ginger root, and maple syrup to warm your bones! Hemp CBD has risen in popularity over the last several years due to a multitude of positive health benefits, one of the main ones being its ability to help regulate the body's natural response to inflammation. CBD is a non-psychoactive cannabinoid within the cannabis genome (hemp and marijuana) which interacts with a network of receptor sites in our body known as the endocannabinoid system. In short, this system plays a huge role in regulating the immune system, inflammatory responses, our nervous system, and pain signals. CBD is well known for having a calming and restorative effect on the body. Matcha is chock full of antioxidants, which act as warriors against free radical damage. We're all confronted with free radicals daily from the toxins in our environment, foods, and personal care products, to good old fashioned stress. To combat their effect we need an army of good guys – this is where antioxidants come into play. Matcha offers an incredible supply of powerful anti-inflammatory and antioxidant flavonols known as catechins. 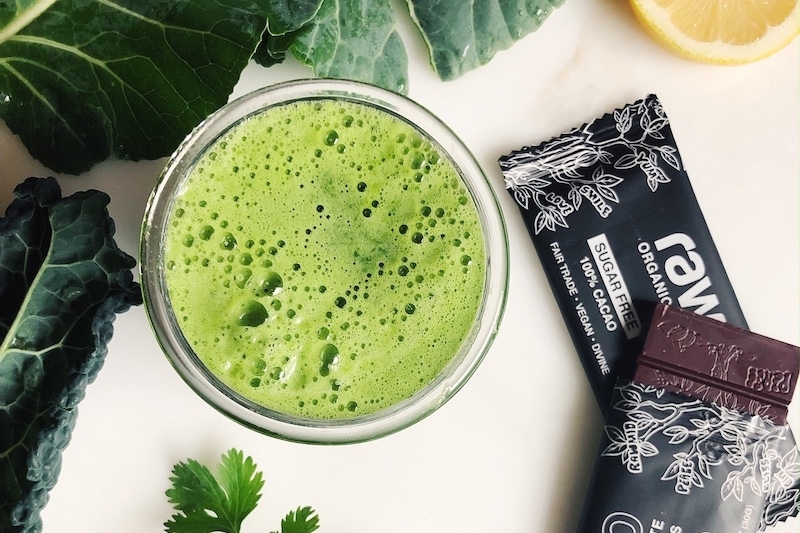 If you're wondering if you can get the same benefits from steeping a bag of green tea, the answer is kind of, but matcha offers a much more concentrated punch. Matcha is also a great alternative to coffee which is more acidic and tends to be more taxing on the adrenals. Dark leafy greens DAILY. If we all stuck with this simple bit of diet advice we'd be in a much healthier place as a society. Most everyone can benefit from eating more greens! They are chock full of alkalinizing minerals, contain loads of antioxidants such as beta carotene, help support our immune system and detoxification processes, help keep our gut healthy, and are low in sugar. Kale, collards, chard, arugula, spinach. Steam them, eat them in salads, juice them, toss them in sandwiches and soups, just get them in your body daily! Not only are berries fun to eat and positively delicious, but they are also our best friends when it comes to lowering the levels of inflammation in the body. Berries offer a wealth of polyphenol antioxidants to protect our eyes and skin and combat oxidative stress and aging. Fruits in general offer lots of healthy vitamins and gut-healthy fiber, but berries have a much more favorable ratio of nutrients to calories, and they also tend to have lower sugar content. If inflammation is an issue, limiting sugar, even the natural sugars found in higher-glycemic fruits such as bananas, grapes, and pineapple may be helpful in bringing the body back into balance. As most of us know by now, not all chocolate is created equal. If you're looking to limit inflammatory foods, you definitely don't want to be reaching for the sugary processed candy bars that line the shelves at conventional supermarkets. However, cacao, the base ingredient of all chocolate, is a true superfood – one of the planet's highest sources of antioxidants. By choosing 85% or 100% dark raw cacao bars, we can get all the benefits that cacao has to offer, without the inflammatory effects of sugar, dairy, and additives. Dark raw chocolate is also highly satiating and is a great way to satisfy a sweet tooth. Celery is certainly having a moment right now, and for good reason. This humble vegetable contains plentiful flavonoids, not to mention an impressive amount of Vitamin C, Vitamin K, folate and potassium. It is low in sugar and contains loads of water and fiber which both help improve overall gut health and hydration. Celery is also awash with beneficial mineral salts which help improve hydrochloric acid production in the stomach, help balance an acidic blood pH, support liver, kidney, and adrenal health, and bring blood pressure back into balance. Many people have found profound benefits from drinking celery juice on an empty stomach daily - including keeping chronic inflammation in check. Ensuring we're getting the right types of fats is imperative when discussing inflammation. Processed fats or the wrong ratio of omega fats (too much omega 6 and 9, not enough omega 3) can worsen inflammation for many. Many people turn to fish oil capsules for omega 3 fatty acids, but there are also plenty of plant sources to enjoy. Chia seeds offer an incredible source of plant-based omega 3, as well as all 9 essential amino acids, more calcium than milk, and a wonderful supply of gentle soluble fiber for the gut. Another awesome option is blue-green algae such as spirulina, or an algae oil supplement. After all, fish get their omegas from algae - why not cut out the middle man and go right to the source. Omega 3's help tame inflammation, are nourishing to the skin, and play a vital role in healthy brain and nerve function. Ingesting enough omega 3 fatty acids also helps support hormone balance – something that affects us on every level. To keep inflammation at bay, it takes more than just eating the right foods. It's perhaps even more important to focus on avoiding the inflammatory triggers in the first place. We're talking refined sugars, highly processed foods, processed, low-quality animal products, fruits and veg grown with pesticides (check out the EWG's Clean 15 and Dirty Dozen list to find which fruits and veg are safest to buy non-organic), too much caffeine, and alcohol. Are You Eating These 11 Green Superfoods for Optimal Health?